Timeless Treasures is a family owned business located in the big apple, New York City. They are a wholesale of fabrics to retailers in the Quilting and Sewing industry. In the infancy of Timeless Treasurers’ cotton line, their design reputation was built on novelty collections such as pigs on motorcycles, rainbow-colored cats and Santa on a surfboard. These collections were all just a few ideas that eventually turned into 100% cotton fabric. 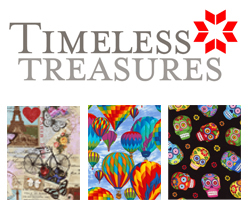 Click here to see which Timeless Treasures fabrics we have on stock. Click here to see all designs of Timeless Treasurers on their own website. 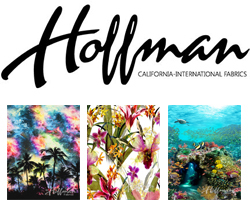 Hoffman California Fabrics is located in Mission Viejo, California. They design and manufacture premium screen-printed and hand-dyed fabrics for the quilting and home-sewing markets. The company is a family business whereas three generations of the Hoffman Family are actively involved in day-to-day operations. Furthermore, their team consists out of professional textile artists whom create 800 designs for Hoffman’s screenprint collections and Bali batiks each year. Click here to see which Hoffman California fabrics we have on stock. Click here to see all designs of Hoffman California on their own website. Camelot fabrics’ headquarter is located in the second biggest city of Canada, which is Montreal. First the company was known as Camelot Cottons and Eugene Textiles, but now with their new name they compass much more of what they do as an eclectic fabric company. Camelot Fabrics is known for their 100% cotton prints, and now their name reflects that. Furthermore they have expanded their assortment with new projects, collections, printed fabrications, artists, licenses & more. 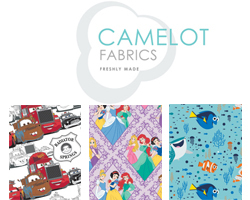 Click here to see which Camelot Fabrics we have on stock. Click here to see all designs of Camelot Fabrics on their own website. Dear Stella is a unique fabric brand with modern style located in the city that never sleeps, New York City. Their collection evokes an edgy freshness, combining the best of old traditions with modern influences. Dear Stella’s fabrics will inspire both a traditional quilter and a contemporary “sewist” to reinvent their sewing style. STELLA is an inspiring, independent spirit. She is creative, adventurous and hopelessly romantic. 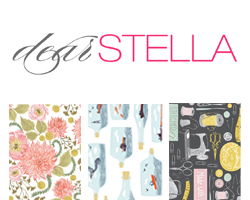 Click here to see which Dear Stella fabrics we have on stock. Click here to see all designs of Dear Stella on their own website. Matilda’s own batting comes from Australia. It is made from the highest quality, and combines Australian materials and processes to produce a premium batting. Their organic Bamboo is the most eco-friendly fibre they produce as it grows without the need for supplemetal irrigation or insecticides. This fibre is 100% sustainable and all naturally grown. 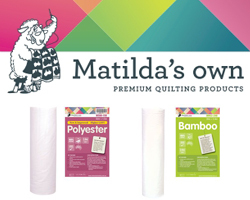 The Bamboo also has natural anti-bacterial properties making it ideal for bedding products, and is arguably the softest wadding that Matilda’s Own produces. Click here to email us for more information about Matilda’s own batting. Click here to see which battings from Matilda’s Own we have on stock. Bohin is a living storehouse of knowledge which is unique in France and rare elsewhere. Bohin’s products allow customers to create the highest quality products under the best conditions. Click here to email us for more information about Bohin France. 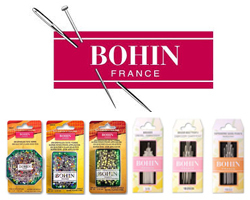 Click here to see the entire assortment of Bohin on their own website.